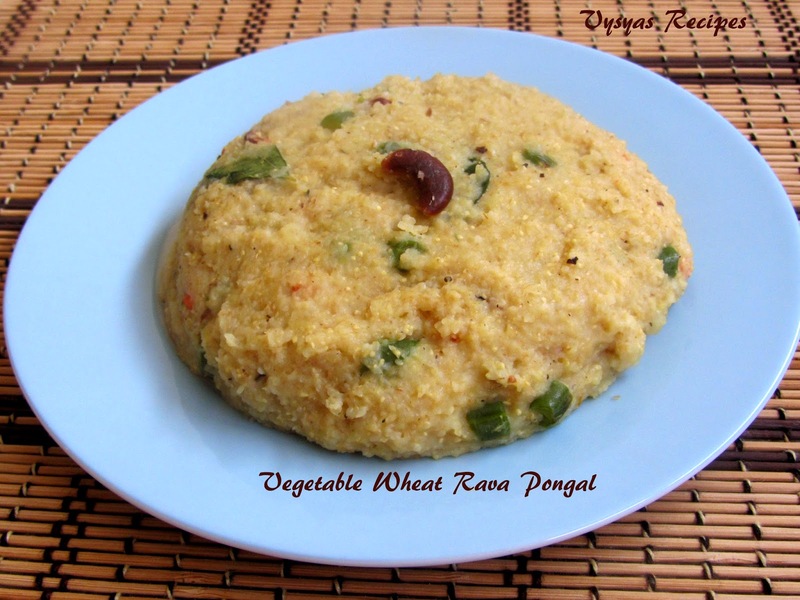 Vegetable wheat pongal is made with Wheat rava, moongdal and some vegetables. Cracked Wheat is a excellent Source of Fiber,pongal made with wheat rava gives a variation in flavor and texture,which is also healthy. Godhuma Rava/Wheat rava - 1 cup. Grind cumin seeds and pepper to a course powder, fry it in a 1/2 tsp of ghee and keep it aside. (fry it for 15 seconds to 30 seconds, within that you get very nice aroma of cumin and pepper corns). Pressure cook moong dal with needed water for 3 whistles(with 1 + 1/2 cups of water) or you can cook it in a bowl with needed water till it becomes soft and mushy. Roast the rava in a tsp of ghee till it becomes hot.(optional). chop the carrots and beans into small pieces and keep it aside. Take a kadai, add 3 tbsp of Ghee, add ginger, and chopped carrot , beans curry leaves. saute till carrot and beans are soft. Add 3 + 1/2cups of water, then add salt, Now add coarse cumin and pepper seeds powder.stir well. when water is almost absorbed by rava, add cooked moong dal, mix well until, everything is incorporated well and water is completely absorbed. It goes very well, with coconut chutney or sambar.